Some owners have a nightmare with their dogs and the car, whether travelling in it or just being able to get them to go in it. If your dog is hyper nervous/scared or aggressively against getting in the car then help from a professional, experienced behaviourist will be required. If you do have a problem with the car then your dog for what ever reason has a bad association with the car. This bad association might have happened before you acquired your friend so what actually happened to give this association may never become apparent. 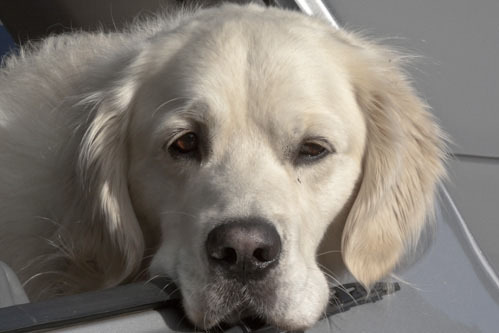 It could be that your pet just has problems with your particular car, so firstly I would try getting your dog into another willing friends or families car to find out. You probably couldn't change your car if this was the case so you would have to follow the following advice anyway but it would be nice to know as I have known some owners who have actually changed their cars (believe it or not). What I do think is a good idea is if when you go to pick up a new pup or dog from their old owners do it in a friends car, often a pup/dog gets a bad association to the car they go home in when leaving their mum and litter mates or old home and a lifelong problem with said car evolves, so if it is a friends car you pick them up in and then use your car in the future the bad association might not be with your car (some dogs will generalise the bad association to any car). If you do have a problem with your car what you have to do is to try and turn this association with the car from a bad one to a good one, easier said than done but in most cases (unless the initial problem was very traumatic to them and makes the dog hyper nervous and scared) it should be sortable with out pharmacological (drugs) help.The route to this may take a while and will require serious time and effort but will be worth it as trips in the car for nice walks, holidays and to the vets should be trouble free for all. As we may not know the reason for the bad association with the car, which could be as simple as a bad first experience when first taken home from mum and littermates as a pup, we will start at the beginning. It would be advantageous to acquire a DAP (dog appeasing pheromone) spray and whenever you do work in the car spray 5 or 6 sprays of it in the car 20 minutes beforehand, I would recommend it. Firstly we need to get your dog to think that the car is a good thing, not going out in it or getting into it; just being near it. We won't be going anywhere in the car yet, just getting your dog used to it so it gets a good association with it. In the vicinity of the car (if safe) do some calling, sit and treat with jolly voice and atmosphere, get the dog in a playful mood, play with the dog using high value toys and treats. We need to do this several times in the vicinity of the car so they are enjoying themselves and hopefully associating this in some small way with the car. Obviously if you have no drive or safe place to do this then you will not be able to try this, but you could approach the car without getting in it and with your dog on a lead do a few sits and treats with lots of fuss, hopefully giving your dog a better association to the car, then try later to get them in it as follows. If all goes well after a few days of playing near the car you can try opening the door or boot and asking the dog in, if they do, ask for a sit and then treat them, they might jump straight back out so then try again, don’t get angry. If they happen to stay in the car then carry on with jolly voice and offer treat after more interaction and a sit. At all times make sure the treat you are using for the reward is good enough, not just one of his everyday dried food biscuits, it has to be salient (good) enough to do the job. You could try cooked liver (quite cheap), chicken, sausage (plain, not herby, not pork etc), not chocolate (can be toxic to dogs). Treats only need to be the size of a small fingernail. Remember again that the treat is only given after doing something you ask for, as a reward for the behaviour (not a bribe, there is a difference). This is enough for the first time, always try to finish on a good note don’t push things too quickly. If you have a dog that is not motivated at all by treats or food then you will need something else like a ball or toy whatever you choose it has to be of high enough value to do the job. You will need a special toy, say a squeaky ball or toy. This toy will be something that only comes out for special play and for in the car so that it remains special, don’t use it for everyday play as its special value to your friend will diminish and so will its appeal and novelty value for training. When you first introduce this new toy big it up with your dog, say “ what’s this then” etc etc and allow them to become really interested in it, play a little with it then put it away. Do this several times and make it the best thing out each time. As with the treats try to move the play to the vicinity of the car (if safe ) and then follow the same routine as above for the treats. Hopefully after some time you are able to get the dog willingly into the car. Now is the time to try very short journeys in the car, just around the block will do and when you do return get straight out and have some jolly play, always finish these first trips with something nice so the dog thinks trip in car means going to something nice. Keep these first trips very short and jolly, you could even stop halfway (if safe) and have some interaction in the car then carry on. If things go well you can think about going further but ensure every trip ends in a fun time (not to the vets for a jab, unless imperative of course) with favourite toys or treats and lots of jolliness or a nice walk, always remember though to treat for something (a sit or good behaviour for example); not just willy nilly. After your dog has become used to going out in the car it would be a good idea to take a couple of trips to the vets, not for treatment but for jollies so that good association with the car and the vets can be made (see /taking-your-dog-to-the-vets topic). Remember also to use the DAP spray in the car before every session that involves you getting in it, five or six sprays 15-20 mins before hand in the car. Hopefully after your dog gets used to being in the car the DAP spray can be dropped. You could of course try things without the DAP but I would recommend it. As I said at the beginning of this section, if your dogs only problem is with the car then you could try all of the above if however they have other issues like bad dog owner bond, highly fearful or nervous behaviour in general, bad sickness when in or travelling in a car or just extreme aversion to the car then the help of a good behaviourist, and maybe a vet too, will be required. Remember too not to push things too quickly, end each little session on a good note and remember any undesirable behaviour or fear/nervousness will take time, effort and calm, firm, fair consistency to sort out. Remember when travelling in your car with a dog to do it safely, however you may decide to do this (dog guard, dog harness, etc). To get yourself a DAP spray at a reasonable price (half the vets price) follow the link to Amazon below. Also you could have a look at car dog guards, harnesses and this top quality boot cover if you have a nice car.